The attack claimed the lives of nine Hazara and one Frontier Corps (FC) soldier who was deputed for the community’s security, said Deputy Inspector General (DIG) Abdul Razzaq Cheema. The 10 others who lost their lives included shopkeepers, businessmen and citizens working or residing in the area. 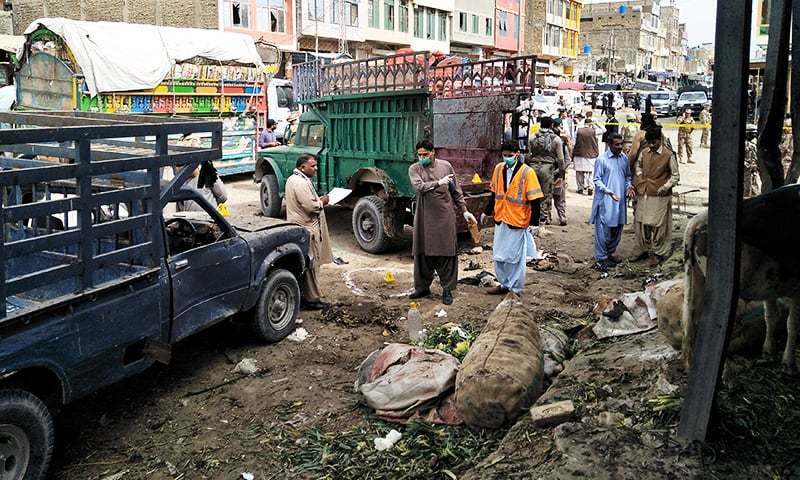 However, Home Minister Ziaullah Langove, who held a press conference later in the day, said that the blast was not targeting “a specific community”. Prime Minister Imran Khan condemned “the terrorist attack” and sought “an immediate inquiry and increased security for the [targeted] people”. Following the blast, a high-level meeting took place under Balochistan Chief Minister Jam Kamal’s stewardship to review and reinforce security measures. Furthermore, it was decided that closed-circuit television (CCTV) cameras will be immediately installed at the Hazarganji market and other public places. Action on terrorists’ hideouts and against their leaders will also be boosted, the caucus affirmed.